We wanted to let you know how grateful we are to have found Laura Kennels and especially to have found you. Our e-mails back and forth were always an enormous pleasure that we looked forward to receiving. 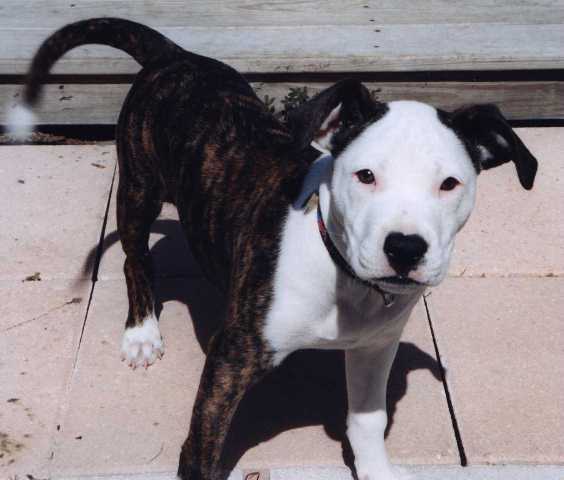 We visited so many Internet websites before we found Laura Kennels but so many of the American Bulldog websites that we visited seemed geared strictly to working dogs. We wanted a home protector and guardian that would be part of our family. Since our Rottweiler has severe hip dysplasia, we were also very concerned about finding an honest, reputable breeder, who really cared about the health of their dogs. In addition, we wanted to make sure we only purchased a puppy from OFA certified parents. Laura Kennels met all of our criteria and was exactly what we were looking for. Our new puppy is perfect! We also have to tell you how much we enjoyed meeting you, Tom, your parents and (especially) Miss Kitty, when we picked our Lucie up. Miss Kitty is remarkable! Thank you so much for your time and hospitality. Lynn, you knew more than we did what we needed in our puppy. We trusted you to find us the perfect puppy and you did! Lucie is a perfect fit. She is so smart, has no fear in her and NEVER backs down from a challenge. Thank you so much for everything! We will always remember you - especially when we look at our Lucie!